I found this idea, but not until the last few days of Sept. We have decided to do this for October. These are expensive times, and families are having to get creative in maximizing their resources. 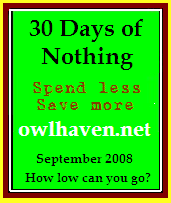 One blogger, Mary of Owlhaven, is a mom of ten kids committed to teaching her kids common-sense frugality by example. She’s hosting a carnival at her blog called 30 Days of Nothing, an idea originally launched a couple of years ago at another blog. The idea is, at once, simple and daunting: Mary and her family aim to cut out all unnecessary purchases, and focus only on the essentials, for 30 days. But Mary’s motivation isn’t purely a financial one. Reasons for doing this include a disturbing sense of entitlement and taking control of our spending. It will be difficult, as anyone who did in September can attest. Iron Man came out on DVD yesterday, but we don’t really need it so we’ll put that purchase off for now [as Anthony pointed out, I’m the one who wants the DVD]. We had already agreed to be accountable to each other and vet every single purchase before we made it. This takes that to another level where the answer will be “no” much more often. We’ve talked about “no doodad” periods before but we haven’t successfully controlled our discretionary spending in awhile. I think this will be good for us.